Choose Edit→Find or press Ctrl+F. Quicken, with restrained but obvious enthusiasm, displays the Quicken Find dialog box. You use this dialog box to describe the transaction you want to find in as much detail as possible. Specify which pieces, or fields, of the register transaction you want Quicken to search. Click the down arrow to the right of the first Find box; then in the drop-down list, select the field that Quicken should look at during the search: Amount, Cleared Status (the Clr field), Memo, Date, Check Number Category, Tag, or Payee. Or get truly crazy and pick the Any Fields list entry so that Quicken looks both high and low. Tell Quicken whether you’re using a shotgun or a rifle. Contains: Select this rule if the field or fields you’re searching just need to use a piece of text. If you enter Aunt into the Find text box and use this matching rule to search Payee fields, Quicken finds transactions that use the following payee names: Aunt Enid, Aunt Enid and Uncle Job, Uncle Harry and Aunt Edna, and — well, you get the idea. Exact: Select this rule if the field you’re searching needs to exactly match your Find text box entry. If you enter the Find text box entry as Aunt, for example, and you’re searching Payee fields, Quicken looks for transactions where the Payee field shows Aunt — and nothing more and nothing less. Starts With: Select this rule if the field you’re searching for just needs to start with what you entered in the Find text box. 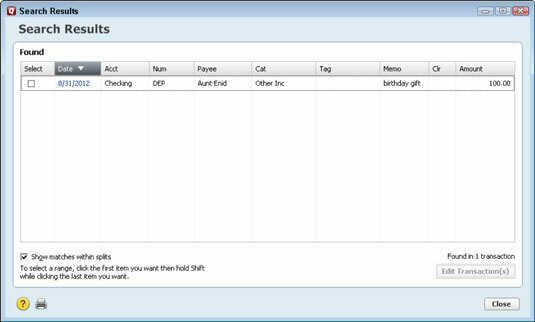 For example, if you enter Aunt in the Find text box, and you’re searching the Payee fields, Quicken looks for transactions where the Payee field starts with the word Aunt — such as Aunt Enid or Aunt Enid and Uncle Job. Ends With: Select this rule if the field you’re searching for just needs to end with what you entered in the Find text box. Greater: Select this rule if the field you’re searching for needs to hold a value that exceeds the number you entered in the Find text box. This makes sense, right? Like you’re looking for checks you wrote for more than $100? Greater Or Equal: Select this rule if the field you’re searching for needs to hold a value that either exceeds or equals the number you entered in the Find text box. Less: Select this rule if the field you’re searching for needs to hold a value that is less than the number you entered in the Find text box. Less Or Equal: Select this rule if the field you’re searching for needs to hold a value that is less than or equal to the number you entered in the Find text box. Enter the piece of text or number that identifies the transaction you want to locate. Move the cursor to the third Find text box. Then type the text or number you want to find. By the way, the case of the text doesn’t matter. If you type aunt, for example, Quicken finds AUNT or Aunt. Tell Quicken whether you want it to search forward or backward from the selected transaction. Select the Search Backwards check box if you want to look backward starting from the selected transaction. You click either the Find or the Find All button to begin the search. If you click Find, Quicken looks through the register, and if it can find a transaction like you describe, it highlights the transaction. If you click Find All, Quicken looks through the register and builds a list of all the transactions that are like the one you describe. Then it displays the list in an expanded version of the Search Results window. To edit a found transaction, select the transaction and click the Edit Transaction(s) button. For example, you may want to locate transactions showing Aunt Enid as the payee so that you can replace Aunt with Great Aunt. The Find/Replace command works in a similar fashion to the Find command except that you need to describe what you want to modify in the found transactions. After you complete the initial dialog box that Quicken displays when you choose the command, Quicken displays a window listing the transactions it has found. You mark — by clicking — the transactions you want to modify, describe the replacement information, and then click the Replace button. 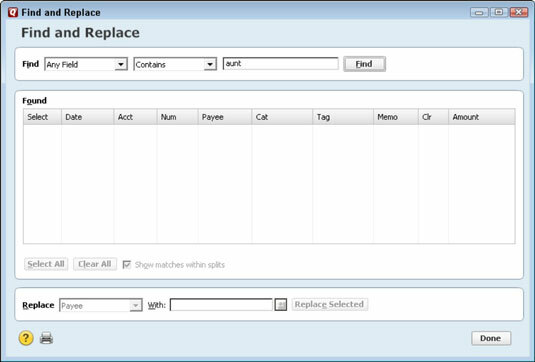 You can use the Find/Replace command to find and replace categories, which is kind of a handy trick. For example, you may want to recategorize all your cable television payments as the Entertainment category (where earlier, you placed them in the Utilities category). 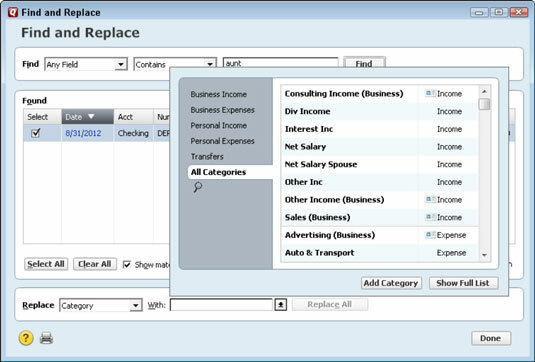 To recategorize, use the Find And Replace command to search the Quicken register for the transactions you want to recategorize. Mark the transactions you’re sure you want to recategorize. Then, click the arrow button next to the With box so that Quicken displays a list of categories and select the category.